All products showing as ‘in stock’ on our website are ready for despatch from our warehouse. Once you have placed an order with us, you will receive a confirmation email. If there are any issues with your order, we will contact you as soon as possible to inform you of this and attempt to resolve any issues. Orders placed before 2pm Monday to Friday (excluding Public Holidays) are despatched the same day. Orders placed after 2pm Monday to Friday and orders placed on a weekend or Public Holiday will be despatched on the next working day*. Therefore, orders placed after 3pm Friday will not be despatched until Monday. *A ‘Working Day’ excludes Saturday, Sunday and Public Holidays. UK Mainland* orders with Next Working Day Delivery selected will be despatched in accordance with our Despatch Policy via a Royal Mail 24 Tracked or Parcelforce 24 service. Orders to the UK Mainland with a value over £75.00 will automatically qualify for free Next Working Day delivery and will be despatched in accordance with our Despatch Policy via a Royal Mail 24 Tracked or Parcelforce 24 service. To receive ‘Free Next Working Day Delivery’ please ensure that you choose this delivery method from the drop-down menu during the checkout process. Please Note: Awning Rails over 150cm in length do not qualify for Free Delivery as they must be sent by a specialist courier (TNT) and have a fixed £8.99 delivery charge. *Postcodes in the Scottish Highlands and some HS, IV, KA, KW, PA, PH, PO and ZE postcodes are not categorised as ‘UK Mainland’ and MAY BE subject to ‘UK Offshore Isles, Highlands and Northern Ireland’ delivery rates. Orders weighing under 3kg will be included as part of UK Mainland delivery rates and will be despatched in accordance with our Despatch Policy via a Royal Mail service. Next Working Day 10AM, Saturday & Sunday delivery services are not available to UK Offshore Isles, Highlands and Northern Ireland Postcodes. Orders weighing over 3kg with a UK Offshore Isles, Highlands and Northern Ireland delivery address will be subject to a £5.00 surcharge in addition to the UK Mainland rate for the delivery method selected. This £5.00 surcharge will also apply to orders over 3kg which qualify for ‘Free Next Working Day Delivery’. All orders over 3kg will be despatched in accordance with our Despatch Policy via Parcelforce. *If a postcode is not entered and an order is placed to a UK Offshore Isles, Highlands or Northern Ireland address where an appropriate delivery method or rate has not been selected, we will contact you for the relevant delivery surcharge, change to an available delivery method or refund your order in full. Orders weighing under 2kg are sent via a Royal Mail International Priority service with an estimated delivery time of 3-5 working days. If an order has a value over £50 then it will be despatched via Royal Mail International Tracked or Signed service depending on which service is available in the destination country. Orders weighing over 2kg will be sent via a courier service. For most countries this will be via a Parcelforce Euro Priority service with an estimated delivery time of 2-3 working days. For other countries we will use alternative couriers which allow us to maintain the lowest delivery prices possible across these countries. Please note: If you are ordering a Voltaic product which includes a Lithium Battery then this will be despatched via a UPS Standard Road Service with a 3-5 working day delivery time and an additional surcharge. For orders weighing over 2kg to the above listed Asia Pacific and North American destinations we use a range of different couriers which helps us to offer the lowest delivery prices possible. Due to the massive variations in delivery costs for other Worldwide destinations we can only offer a ‘Price on Application’ (POA) for orders weighing over 2kg. If you would like to order an item over 2kg to a worldwide destination, please email us at sales@funkyleisure.co.uk and we can provide you with a delivery quote. For an update on the current status of your parcel, please check the tracking information provided in the despatch confirmation email. 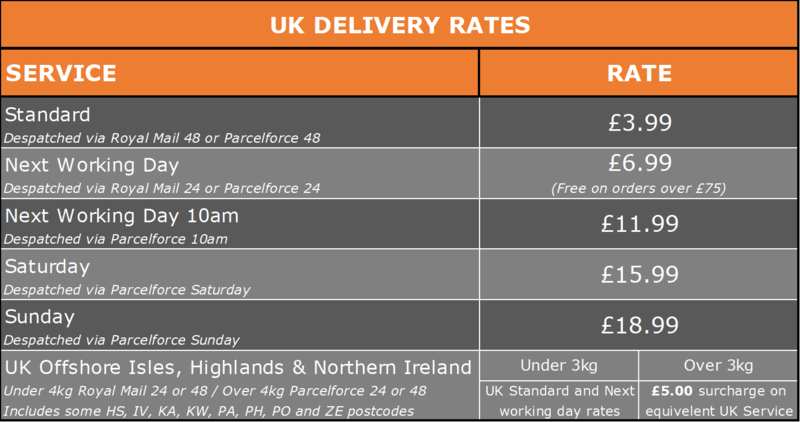 Parcelforce 24, 10am, Saturday & Sunday are considered premium services. If a Parcelforce 24 order is not received next working day, we can offer a refund on the difference paid between next day and standard delivery. No refund will be applicable for orders which qualify for free next working day delivery. 10am, Saturday & Sunday delivery charges are fully refundable if delivery is not attempted by the specified date. Delays caused by adverse weather conditions, major incidents, sporting events etc… are out of the control of courier services. On this basis, unfortunately, we cannot refund any delivery charges for late deliveries due to the circumstances. If an item arrives in a damaged condition, this must be reported within 3 days of parcel receipt. We can only investigate missing orders if they are reported to us within 8 weeks from the date of despatch.